Just got back from another exciting two days of dog shows up in Spring Grove. Normally that means hours of sitting around waiting for each of my dogs to make their two minute runs. I lucked out this weekend – sure, it had the standard waiting around for hours waiting for each of the dogs to make their two minute runs, but this time I was able to spend some quality time at the Chain ‘O Lakes State Park. This is actually the park Linda bribes me with every time they have a show up there. There’s been a lot of good bird sightings up there (link here and here) and in general a very nice park (complete with snakes). Saturday I got to get my 10.5 mile training run in on their very nice trails although I underestimated how hilly those babies were which pushed me pretty good (give Linda credit for waiting around for me to finish that long run). Today I had the opportunity to go back and spend a few hours walking a few of the trails with the Beast. Not a lot of birds in the water but did catch a few tree birds in between sprinting away from the mosquito hordes. Surprised there wasn’t much in the water but the trails were pretty noisy with people which might have spooked them before I got there. No harm (other than the 50 bites all over my body) it is always good to be out with the Beast especially if I in place of sitting around in a cold building with people strategizing on whether to go behind or in front of the dog to get to the next obstacle. 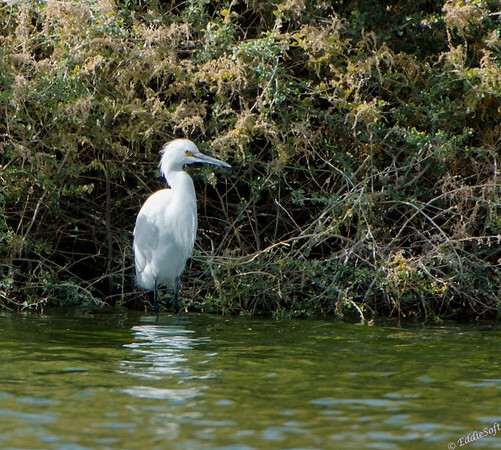 Although I didn’t find any birds enjoying the backwaters, I figured it would be fitting to bring out another NEW bird from the shoot that did have a lot of water sightings – that’s right, our old friend the Henderson Bird Viewing Preserve produced, yet again, another birding list check mark. What wonderful bird are we featuring today? It is a difficult to distinguish from this particular shot but the yellow between the eyes and the black bill gives some pretty good clues. The critical part isn’t visible from this particular shot because it chose to stand in the water while looking for breakfast. I’ll ruin the suspense and tell you it has very yellow feet which you will see in a shot further down the post. 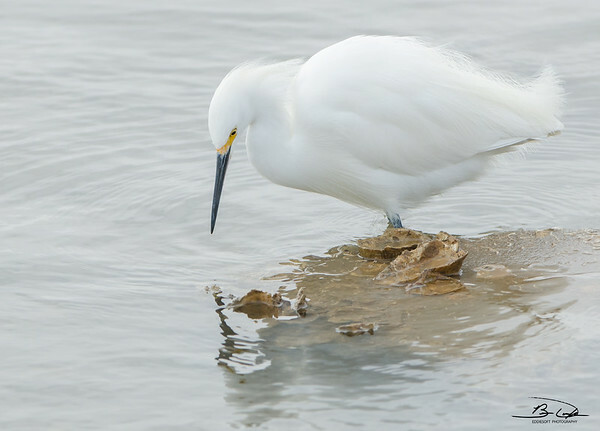 It is still not a lock because there seems to be some confusion in the various books on Snowy Egret vs the Little Egret. 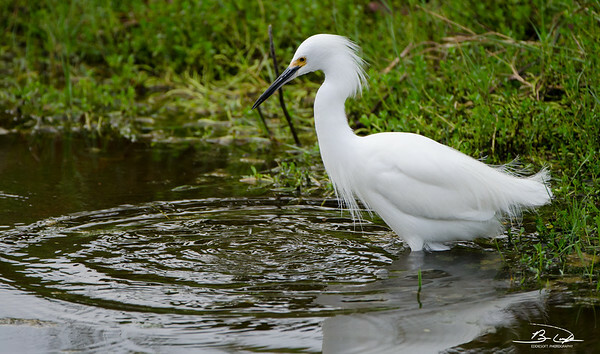 The Stokes book clearly calls out the Snowy Egret having the yellow coloring between the beak and the eye where the Little Egret has more of greenish hue. This seemed like a lock until reading further in the Little Egret description and learning that breeding times it can change to a red, orange or yellow hue. Hmmm … wait wait .. it looks like when this happens the feet turn red or orange. 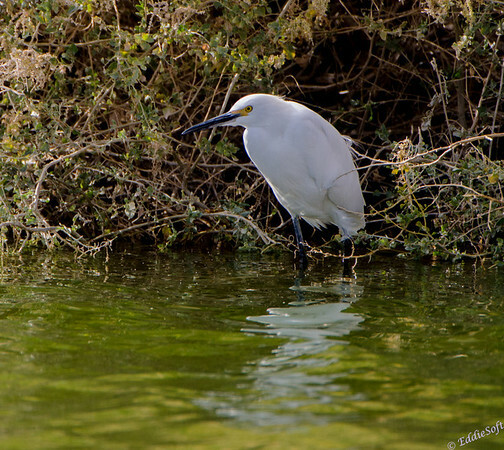 So based on that, I am definitely going with the Snow Egret unless someone has more knowledge on this particular species and can provide a more definitive answer to the contrary. Until then I’m happily putting the check mark in the list! I spent a lot of time with this particular bird trying to find the best way to compensate for the somewhat harsh light. Not wanting to blow the shot completely I actually tried a lot of different settings to help bring out the detail in the white that didn’t blur in the wind or bird movements. 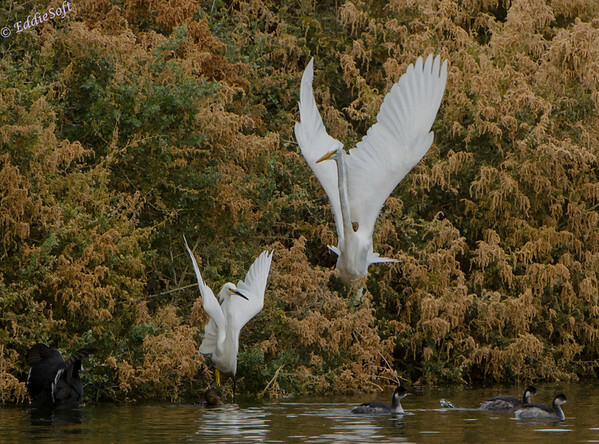 These white birds cause havoc in good light, much less late morning direct light. A big thanks to Adobe for some nifty tools in the digital darkroom that lets me tweak the shots in an attempt to make the good shots a little better. Of course, it doesn’t hurt these birds are extremely photographer friendly being such still hunters.